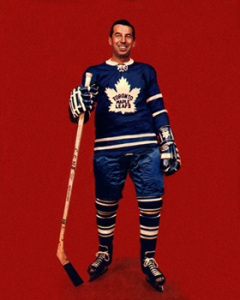 50 Years Ago in Hockey: Bower Returns - Leafs End Slump! 50 Years Ago in Hockey: Bower Returns – Leafs End Slump! Toronto Maple Leafs goalkeeper Johnny Bower made a successful return to the nets last night as his team defeated the New York Rangers 4-1 at Maple Leaf Gardens in Toronto. In the only other NHL contest, the Montreal Canadiens edged the Chicago Black Hawks 3-2. Bower, who missed the past two weeks with cracked ribs, had to be sharp early in this one. The Rangers held the edge in play throughout the first period. They scored the only goal of that opening frame when former Leaf Bob Nevin, now the Ranger captain, tipped in a Rod Gilbert 35-foot shot on which Bower had no chance. Toronto got their legs in the second stanza and took over the game with three goals. Ron Ellis, Dave Keon and Ron Stewart found the range for the Leafs, with nary an answer from the Rangers. Keon’s goal was his 20th of the season, marking the fifth successive season in which he has reached that plateau. Ron Stewart scored twice for Toronto. Stewart added his second of the night just before the two-minute mark of the third. With the issue no longer in doubt, Toronto coasted the rest of the way home. The Rangers lost left winger Doug Robinson when he was mildly concussed by a Bob Baun check. Robinson apparently fainted twice on the Ranger bench after the hit and was taken to hospital after the game for observation. Toronto outshot New York 27-23. The game had absolutely no bearing on the final standings as the NHL heads into its final week. Toronto will finish in the fourth and final playoff spot, while the Rangers are firmly entrenched in fifth. Toronto coach Punch Imlach said after the game he has no preference as to whom his team plays in the playoffs. Captain George Armstrong echoed his coach’s sentiments. Armstrong was asked about the Toronto slump which, prior to last night, saw them earn only five points in 12 games. Power play goals by Jean Beliveau and rookie Yvan Cournoyer just over two minutes apart in the first period gave the Montreal Canadiens a 2-0 lead over the Chicago Black Hawks en route to a narrow 3-2 win for the Habs. The goal for Cournoyer was his first in two months and seventh of the season. 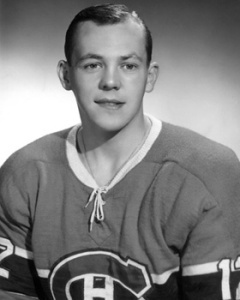 Yvan Cournoyer scored his first goal in two months. Ken Wharram put the Hawks on the board half a minute into the second period, but Claude Provost restored the two-goal late in the period and the Canadiens never looked back. Bobby Hull snapped a 10-game goal-less streak in the third period with a blistering slap shot that thankfully missed Montreal netminder Charlie Hodge. Most in the rink felt that had Hodge managed to get some part of his body in front of Hull’s howitzer, the results may have been fatal. The goal was Hull’s 39th of the season. Hodge put in a workmanlike effort for the home side, making 27 saves. Glenn Hall stopped 29 Montreal drives and could not be faulted on any of the Montreal markers. The Oshawa Generals squared up their OHA playoff series with the Niagara Falls Flyers at two games apiece with a narrow 3-2 win before a crowd of 4,469, largest of the season in the new Oshawa arena. Former Flyer Bill Bannerman led the way for the Generals with a pair of goals, both in the second period. Ron Buchanan had the other Oshawa goal, the first of the game. Jean Pronovost and Andre Lajeunesse connected for the Falls. The game had all the earmarks of a contest that was going to get out of hand after a first-period brawl that saw Don Marcotte of the Flyers and Jim Whitaker of Oshawa given five-minute majors for fighting. Referee Frank Slota cracked down, and the final 40 minutes were played in a much more orderly fashion. Doug Favell was between the pipes for Niagara Falls, replacing Bernie Parent, who injured his hand in the previous game when he landed a punch on the noggin of Oshawa’s Wayne Cashman. General’s goalkeeper Dennis Gibson was the star of the show for the Generals, playing easily his best game of the series.